Around 120 years ago, Batu Gajah was enjoying the Kinta Valley Tin Rush and was the second most important town in Perak after Taiping. 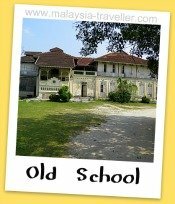 In 1884 it was chosen as the capital of the Kinta district and government offices were located here. 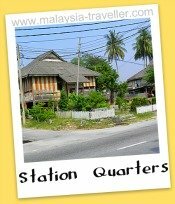 Most tourists bypass Batu Gajah on their way to Pangkor Island or after stopping at nearby Kellie's Castle. Since I was in the area I thought I would take a look at this small Perak town, about 20km south of Ipoh. I had read that there were a few interesting old buildings to see. I was not expecting much but I was pleasantly surprised. On reaching a square in the town centre I found a large billboard headed Batu Gajah Heritage Trail and providing photos, a map and details of 24 of the main heritage sights. I later found out that this billboard was produced by the Kinta Heritage Group in collaboration with Tourism Perak and the District Council and that there is a free brochure containing the same details. Since I did not have the brochure at the time I photographed the billboard, noted down the main attractions and set off to replicate the suggested heritage trail. 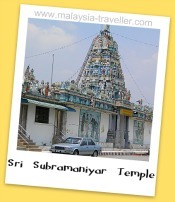 Starting on Jalan Pusing, the first point of interest is the Sri Subramaniyar Swami Kovil, the main Hindu temple in the town. 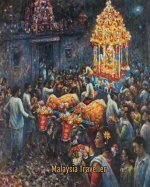 It is scene of the annual Panggani Uthiram festival to honour Lord Murugan during which devotees carry heavy kavadis to fulfil vows. The roofline of the temple is topped with a colourful tiered gopuram (tower of South Indian design) and detailed statues of deities and other characters. 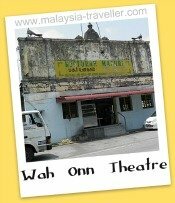 Next door is the Wah Onn Theatre building of which only the front ticket office remains and now serves as a noodle restaurant. It looks very tatty but has a couple of peacock statues on the roof. The main part of the cinema used to be a wooden structure with wooden seats and ceiling fans. Entertainment-starved townsfolk would cram in here to watch the latest black and white movies and puff away on cigarettes. Not surprising it burnt down. Continuing down the street I saw two modest but lovely old wooden bungalows on stilts with tin roofs where the railway station master and his assistant lived. Apparently they are still used as Railway Staff Quarters. Across the road is the Old Railway Station itself. This was used until 2007 when a new station was opened just outside the town centre. 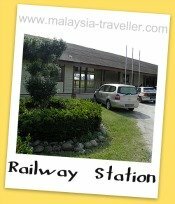 The Kinta Valley Railway line from Ipoh to Batu Gajah was completed in February 1984. There is a restaurant and a barber shop using the station building now. The trail takes us past the so-called New Town(actually quite old, dating from the 1890s, and is an area of traditional shop houses) and a brand new mosque. Down a side street are the banks of the River Kinta. In the middle of the river are a pair of boulders which resemble elephants. 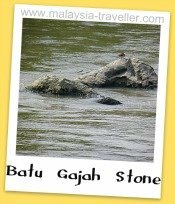 The name Batu Gajah meansStone Elephant. There are a number of legends about how the name originated. One of them has it that a pixie named Sang Gedembai turned two elephants into these rocks. 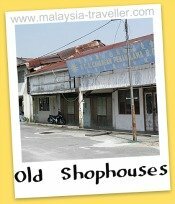 Nearby are some wooden shophouses which were part of the original Old Town, an area alongside the river that was used to transport tin ore downstream and to bring in supplies. It was then a rough area with gambling and opium dens, brothels, liquor shops where tin miners would spend their wages. Opposite is Kuan Tay Temple, the oldest Chinese temple in town. At the top of the incline the ground levels out to a flat area raised above the town centre below. On this small plateau, the British built their settlement. They drained the swamps, constructed proper sanitation, cleared jungle and landscaped the scenery. Jalan Changkat runs the length of this plateau and here the colonials built all the familiar institutions of Empire that they needed - namely the club, bungalows, police station, court, offices, gaol, hospital, church and cemetery. The Kinta Gymkhana Club was formed in 1890. Race meetings on the 7 furlong track were usually held at Chinese New Year and attended by Malay Royalty. After WWI, horse racing was relocated to Ipoh and the club became the Kinta Golf Club. 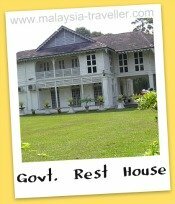 Next to the club is the Government Rest House, a substantial and attractive building which would have accommodated visiting Government officials in some style and probably served an excellent curry tiffin. It was clearly the best place to stay in town and might still be today if you can manage to arrange it. 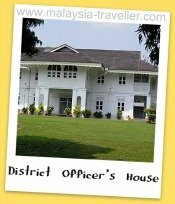 Some distance away is the District Officer's House a handsome home built in the 1890s for the most senior government official in the district, JBM Leech. It still appears to serve the same purpose today. 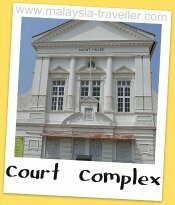 Next is the Government Offices & Court Complex which I think must be one of the best surviving colonial era buildings anywhere in Malaysia. It is actually made up of three very attractive buildings linked together by covered walkways. Completed in 1892, the centre piece is the Court House which bears a plaque inscribed Idris Ibni Iskander Shah, Sultan of Perak - Frank A. Swettenham, British Resident - Francis St. G. Caulfield, State Engineer. After the court comes the Gaol. It was built in 1888 but strangely the surrounding wall was not built until 1894! Presumably the prisoners were confined to their cells until then! It is quite a large gaol for a town which only had a couple of thousand inhabitants at the time. I wonder why? The locals did not look especially roguish to me. 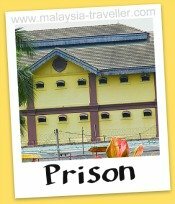 Apparently much of the jungle clearing and landscaping work in Batu Gajah in the early days was performed by prisoners. Famous inmates of this prison included Lim Bo Seng and Sybil Kathigasu who both suffered torture at the hands of the Japanese during WWII for their support to the anti-Japanese resistance. 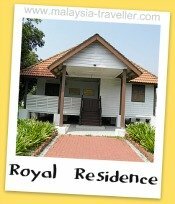 Almost in the shadows of the prison walls is a humble house which was the childhood home of HRH Sultan Azlan Shah. The plaque outside indicates that he lived here from 1939 until 1949. 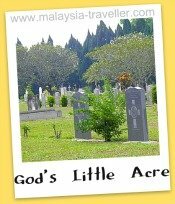 Close by is the Batu Gajah Christian Cemetery, also known as God's Little Acre. The notice board outside reads; "The Little Acre in Batu Gajah. This Anglican Christian Cemetery dates back to 1891. In it are interred more than 600 persons many of who were early pioneers in Perak. Additionally a large number of planters, miners, police and military personnel who lost their lives during the Emergency Years (1948/1960) also lie at rest herein. May their souls and those of the faithful departed rest in peace always." You can read more about this cemetery on my blog. Passing the Anglican Church next to the cemetery, Holy Trinity, you will see the hospital complex which used to have an exclusive ward for European patients. 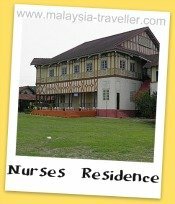 The former Nurses' Residence is an imposing wooden two-storey building that now serves as the hospital administration office. 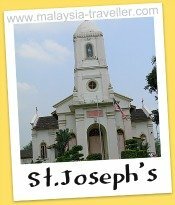 Finally, at the end of a cul-de-sac past the hospital is the Roman Catholic St. Joseph's Church. It was built in 1928 when Fr. Noel Maury was parish priest. There is a school and Catholic Cemetery next door. Catholicism was brought to the area by a French missionary, Fr. P Allard in 1882. He introduced fruit and vegetable farming as a means of converting his 250 or so mainly Chinese congregation. This ends the Heritage Trail. By pressing on the zoom out button on the map above you can get an idea of the town's location relative to Ipoh. Driving is easy enough. Exit the North South Expressway at Junction 135 (Gopeng) and follow the signposts to Batu Gajah. I did not see any hotels of note in the town centre. If you are a golfer, the nearby Clearwater Sanctuary Golf resort might be suitable. 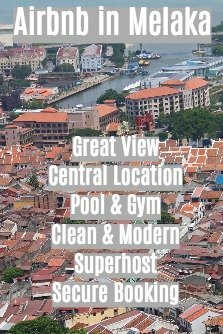 Otherwise Ipoh is only 20km away and has plenty of hotel choices.